All of these unique titanium rings are designed and hand-made to order by Dr. Daniel J. Statman. These rings make perfect wedding bands, since they are virtually indestructable. All of the rings are individually carved from solid bars of titanium. I prefer to use grade-5 titanium alloy (6/4 titanium), but if you would like grade-2 titanium (commercially pure), just ask. Both grades are the same price. 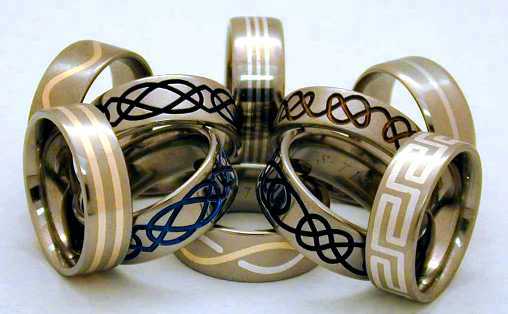 All of the rings are seamless and the inlaid or surface carved patterns uniformly cover the entire ring circumference. There are no irregularities in the patterns for any ring size. These rings cannot be resized using conventional jewelry making techniques. If the ring is too large then a new ring will need to be made, but if the ring is too small it can be enlarged by removing a small amount of inside material. It is important to try to accurately size your finger before ordering. Please visit a local jewelry store and get your finger sized using the standard metal sizing rings. If you have an idea for a unique design, custom orders are encouraged!